Make the Periodic Table Easy to Handle with Hands-On Elemental Displays. 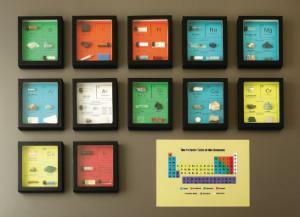 Bring the Periodic Table to life with exhibits of the actual elements. These innovative display mounts allow students to see elements in their natural form, furthering understanding of these essential building blocks of the world. Each exhibit is self-contained and sealed in a glass case, for safe handling in the classroom. Components that are highly reactive or recognized as significant health hazards (such as pure Sodium and Bromine) have been simulated in realistic representation. Featuring 12 elements from across the Periodic Table, this set of display mounts transforms ordinary lessons into hands-on learning opportunities. Each exhibit houses the element in its natural form, reveals its common sources, and highlights two everyday applications. The background of each display is color-coded to match the companion Periodic Tables. Includes four metals: sodium, magnesium, aluminum, and calcium; two transition metals: chromium and copper; two metalloids: boron and silicon; two non-metals: carbon and nitrogen; one halogen: bromine; and one noble gas: argon. The entire set is packaged in a convenient storage box. More effective than pictures and charts alone, these display mounts put the elements directly into students’ hands. This advanced set of exhibits features 36 color-coded elements in their natural state. Each display also highlights the element’s common sources and two everyday applications. Includes 12 metals: lithium, beryllium, sodium, magnesium, aluminum, potassium, calcium, strontium, indium, tin, lead, and bismuth; eight transition metals: titanium, chromium, manganese, iron, copper, zinc, gold, and silver; four metalloids: boron, silicon, germanium, and antimony; seven non-metals: hydrogen, carbon, nitrogen, oxygen, phosphorus, sulfur, and selenium; three halogens: fluorine, chlorine, and bromine; and two noble gases: helium and argon. This extensive collection is housed in three separate storage boxes.